This article explains what a teleprompter is, how it can make your video productions better and how to hire a Chicago teleprompter company. What Does A Teleprompter Do? To be truthful, prompter service does add a bit of cost to the overall video production budget. We will be bringing a very specific piece of equipment, computer and an operator to the video shoot. Then there is travel time, Acclaim Media covers a wide area of travel when running teleprompter in Chicagoland . Regrettably, budget is usually the single factor when clients decide to add this to the budget or not. Before you decide, balance what a teleprompter will do to relieve the stress of the person on camera versus the actual cost to the budget. Stress relief is the best reason to use a teleprompter service. I will never forget how obvious this became during a video shoot. The CEO of a large Real Estate Development Company was scheduled to do an “on camera” address for a video. He had immigrated to the US, and although his English was very good, it wasn’t his native language. He had four lines to deliver to camera in this video based on the script. We budgeted for a teleprompter to be brought in but the $250 half day cost was cut due to “tight budgets”. So we were told to shoot the video without a prompter. After an hour of cursing and meltdowns the CEO, still had not delivered the four lines. His meltdown was epic, and every time he flubbed he got more embarrassed, iit was amazing. we never did figure out if it was the lights & camera, crew and staff all watching him on a monitor, English as a second language, or other- but he could not deliver as he had hoped he would. In the end, we cut it down to two lines and quickly had his wife deliver the other lines. Do you have a CEO who likes to “verbally wander”? Keeping people on track is another great reason to use a teleprompter. Today, more than ever, we need to keep videos shorter than longer. [See “How Long Should A Corporate Video Be?”] Taking the time to script the on-camera is a great way to keep your presentation succinct and ensure all your points are made. Then you can just export the document electronically and we can import it into the teleprompter. Last minute changes in the teleprompter script? No problem. We can still amend any text necessary even during the video shoot. We’ve seen clients re-write the presentation at the video shoot due to events changing. After the video shoot we can export a copy of the updated script for your records. Besides making your talent feel more relaxed, teleprompter service aids your budget in another hidden way. The video shoot actually goes more smoothly which means less (bad) footage shot. This helps conserve editing with costs as we don’t have to cull through so much footage. Teleprompters also give us more creativity. One of our clients, Susan Finerty is an amazing author and consultant who writes about business communications. We recorded Susan on a green screen stage having her read through the teleprompter on a “medium shot” and a “wide shot”. Since Susan read the exact same content each time through the teleprompter, we were able to edit videos to make it look like a two camera shoot when it was really one. This saved her budget the cost of bringing in a second camera and person. It also makes the videos more interesting as we were able to change views often. This helps with viewer retention as the video is more interesting to watch. How Do You Hire A Chicago Teleprompter Company? It’s simple really. Many of our corporate video clients just add our teleprompter service onto their current video production budget. However, we also offer Chicago teleprompter services for outside video production companies. Many area companies have a need only once or twice a year. With one easy call we can discreetly fulfil this need. We’ll even “white label” as their employees if they wish and provide the “team t-shirt”! In other instances, clients may have a film crew coming from overseas or even across the US. This is a perfect use for our Chicago teleprompter services. Why fly another person and piece of gear to Chicago only hoping that it is not damaged in transport? Acclaim Media can locally take care of your need for prompting services. 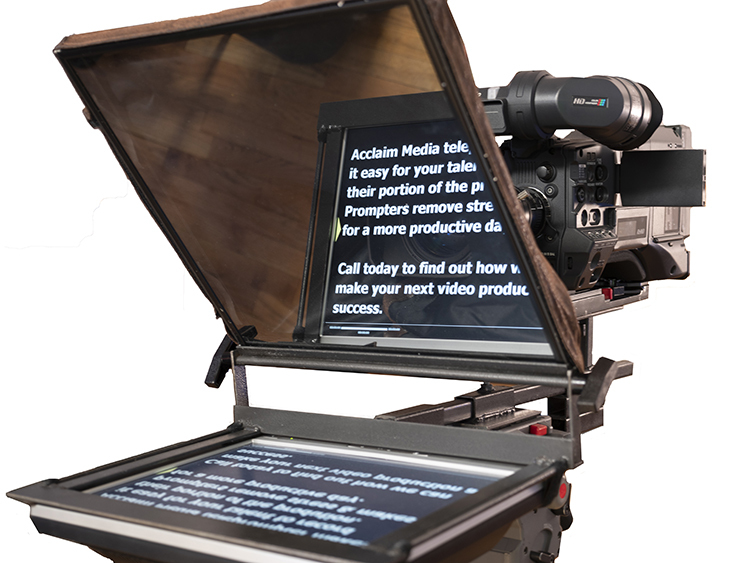 When you know you need to do a video shoot in and around Chicago, call Acclaim Media to arrange for us to be your Chicago teleprompter services provider.